mLearnCon, the most intensive and informative annual conference on mobile learning in North America, is fast approaching. With well over 100 sessions available, how does one choose which events to attend and which ones to give a pass? Float Mobile Learning staff have attended every mLearnCon conference since they started four years ago, both as presenters and exhibitors. We are in a good position to make recommendations as to which sessions you might like to attend, depending on your interests. Of course, we hope that you stop by our booth (#416) to see what we offer and to chat. But, we know attending this conference means that you want to maximize the amount of knowledge that you receive at this outstanding event. Select any of the above categories to be taken to that section of this post. Is this your first time at mLearnCon? Is mobile learning something that you just started to look at? mLearnCon has something for everyone. From complete novices to advanced presentations, no one will be left behind. Workshop P1 Enterprise mLearning: From POC to Pilot to Production Robert Gadd 8:30 a.m. -4:30 p.m. Session 101 Ten Essentials for Successful Mobile Learning Implementation Scott McCormick 10:45 a.m. Zero to Mobile in 12 Months: Deloitte’s Mobile Learning Story Audrey Polce, Mary Duncan, Tonya Corley 2:30 p.m. Session 602 Designing a Mobile App from Paper to Delivery Nick Floro 2:45 p.m.
Assumptions Gone Awry: Mobile Learning for Baby Boomers and the Silent Generation Kevin Smith, Marlo Foltz 2:45 p.m.
mLearning DemoFest A collective showcase of mLearning examples where conference participants show off their latest projects. Move from table to table 5:00 p.m. -7:00 p.m. Session 807 Project Management for mLearning Implementation Charmin Olion 8:30 a.m.
Are you a manager or executive with decision-making power in the learning and development function in your company? There are lots of workshops and sessions that are specifically designed for your interests. Many of the sessions that are targeted toward you will focus on “mobile learning strategy” rather than the details of how mobile learning materials are developed. If you have the time and money, Brenda Enders’ workshop on “crafting your mobile learning strategy to ensure success” on June 17 would be a good place to start. Sessions on developing the business case for mobile learning, case studies of successful implementations, discussions of return on investment (ROI), and decisions like whether or not to allow employees to bring their own devices to work will all be of interest to managers and executives. Decision-makers also need to develop plans and roadmaps to plot the direction of any mobile learning initiative. 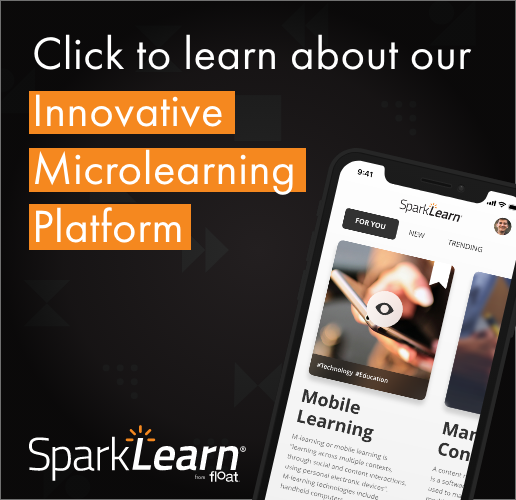 Stop by the Float Mobile Learning booth (#416) to see our mobile learning roadmap and to sign up for our newsletter, which features the latest industry news and trends. Workshop P2 Crafting Your Mobile Learning Strategy to Ensure Its Success Brenda Enders 8:30 a.m. – 4:30 p.m.
Building Success into the Business Case for mLearning in Your Organization Chris Van Wingerden 10:45 a.m. Session 104 No Computers? No Problem. AT&T’s Approach to Training Retail Employees Dave Smelser, Mark Schuster 10:45 a.m. Session 105 mLearning at BlackBerry: A Global Case Study Ashly Knox, Robert Gadd, Tammy Gillis 10:45 a.m.
Less is More: GE Capital Reduces Training Time by 70% While Adding Content Michael Joseph, Valerie Norvell 1:00 p.m. Session 207 The Case for Growing Mobile: Building ROI Charles Welsh, Jacqueline Beck 1:00 p.m. Session 301 Myths and Realities of Cloud-based Technologies for Learning Shannon Jackson 2:30 p.m. Mobile Design Stage How to Sell Executives on Mobile Training Donna Wells 12:00 p.m.
mLearnCon is especially rich in sessions for content developers and instructional designers. There are seven pre-conference workshops that you can sign up for that relate to content development in mobile learning, ranging from agile design to the uses of the new Tin Can API to track informal learning. The focus of concurrent sessions is on designing materials for mobile learning, storyboarding and prototyping of apps, and learning about different authoring systems that can be useful in developing mLearning content. Because there’s nothing like seeing a real-life program to show what is possible, content developers and instructional designers should not miss the two-hour DemoFest on Wednesday night. It will be one of the highlights of the conference. Agile Design for mLearning and Other Modalities Michael Allen 8:30 a.m. – 4:30 p.m.
Looks Matter—Designing mLearning for Maximum Impact Paul Clothier 8:30 a.m. – 4:30 p.m. Create eLearning and mLearning with Adobe Captivate Joe Ganci 8:30 a.m. – 4:30 p.m. Mobile Learning with Articulate Storyline Ron Price 8:30 a.m. – 4:30 p.m.
Design Before Develop: Storyboarding and Prototyping for Mobile Kevin Thorn 8:30 a.m. – 4:30 p.m. Create HTML5 Magic with Adobe Edge Tools Pooja Jaisingh 8:30 a.m. – 4:30 p.m.
Systems Thinking: Designing mLearning with Tin Can (the Experience API Neil Lasher, Michael Hruska 8:30 a.m. – 4:30 p.m. Session 102 Choosing the Right Tool to Develop Mobile Learning (and eLearning, too!) Joe Ganci 10:45 a.m. Session 108 Storyboarding a Serious Comic: A Case Study Kevin Thorn 10:45 a.m. Session 110 B.Y.O.L. : Hands-on mLearning Development with Articulate Storyline Ron Price 10:45 a.m.
Tech and Tools Stage Mobile Learning Development Tools: Compare, Contrast, and Compete! Joe Ganci 1:00 p.m.
How to Communicate to the Visual Cortex—What Learners Don’t See Kevin Thorn 1:00 p.m. Session 208 Adaptive Learning Using Articulate Storyline Triggers Dan Myers 1:00 p.m. Session 211 The Trouble with All Those Boxes: Designing for Ecosystems Instead of Screens Steven Hoober 1:00 p.m. Session 302 Learning Everywhere: How Content Strategy is Transforming Training Chad Udell 2:30 p.m. Session 308 English, Spanish, Portuguese, Turkish: Developing Localized mLearning! Pooja Jaisingh, Risa Blair, Zulfu Gen 2:30 p.m. While instructional designers work with content developers to produce mobile learning materials, media designers plan and create a graphic, audio, video, and animation productions that support learning on mobile devices. One of the newest trends is the use of “tiny video,” which is sometimes only a few seconds long. A variety of sessions on the user interface (UI) and user experience (UX) for designers will help those in charge of media productions do a better job. Several of these sessions are offered at the “mobile design strategies stage.” This is where practical demos of different techniques will be of interest to those who have to build rich media. Stephen Haskin 8:30 a.m.-4:30 p.m.
Rocky Mitarai, Peter Ryce 2:00 p.m. Session 509 B.Y.O.L. : Improve Your Graphics (Traditional and 3-D) Using Photoshop Phil Cowcill 1:00 p.m. B.Y.O.L. : Rapid Video Development for Mobile earning Stephen Haskin 4:00 p.m. Session 912 Mobile Learning—YouTube Style Sarah Gilbert 9:45 a.m. Most of the sessions at mLearnCon do not require heavy technical knowledge in order to enjoy and benefit from them. But, because this conference is co-located with mLearningDevCon, a number of sessions have been developed specifically for those with a programming or technical interest. The Wednesday night DemoFest will be of interest because of all the examples that will be shown. Designing and Developing Learning Using HTML5 Nick Floro 10:45 a.m. Session 403 Redefining the Document: Creating Content for a Mobile World Harley O’Brien 10:45 a.m.
Tech and Tools Stage Combining Media for Delivery on Mobile Devices Nick Floro 11:00 a.m. Session 608 Platform and Operating System Considerations Rick Zanotti, Yury Uskov 2:30 p.m. Session 709 B.Y.O.L. : Adobe Edge Animate—Flash-like Interactions for HTML5 Devices Jeff Batt 4:00 p.m. Session 711 Insights into How Users Interact with Their Touch Devices and How Best to Design for Touch Steven Hoober 4:00 p.m.
‘Nuff Said: Tips and Tricks from Digital Comics to Breathe Life into Your HTML5 Michael Sheyahshe 4:00 p.m.
mLearning DemoFest A collective showcase of mLearning examples where conference participants show off their latest projects. Move from table to table 5:00 p.m. – 7:00 p.m.
Debbie Bodinger, Jake Edmondson 8:30 a.m. Session 803 From Instructor-based Training to the Smartphone Eddie Hartman, Erik Rodriguez 8:30 a.m. Session 804 Qualcomm Mobile App Showcase and Developer Q&A Geoff Stead 8:30 a.m. Session 812 PowerPoint-to-HTML5 Showdown Garin Hess 8:30 a.m. Session 909 B.Y.O.L. : Building jQuery Mobile Apps in DreamWeaver Jeff Batt 9:45 a.m. Session 910 B.Y.O.L. : How to Easily Develop Both Responsive and Position-based eLearning and mLearning Paul Schneider 9:45 a.m.
Workshop P12 Systems Thinking: Designing mLearning with Tin Can (the Experience API) Neil Lasher, Michael Hruska 8:30 a.m. – 4:30 p.m. Session 304 Assessments Through the Learning Process, Mobile Style Jeff Place 2:30 p.m. Session 506 Mobile Learning and Big Data: Implications and Applications for Training Gary Woodill 1:00 p.m.
Tools and Tech Stage Beyond the Numbers: Yielding Meaningful Results from Data Curt Rogers 2:00 p.m. Session 811 I Didn’t Know You Could Do That in Articulate Quizmaker! Debbie Richards 8:30 a.m. Session 908 Knowledge Reinforcement: Intuitive Surgical’s Experience with Qstream John Kettles 9:45 a.m. The sales and marketing department is often the first group in a company to implement mobile learning, especially when sales staff are traveling in their jobs. Four sessions were identified as being of interest to this group. Also, several of the exhibitors will be focusing on the use of mobile learning for sales enablement, which Chad Udell has written about recently. Session 204 Mobile On-the-Go! Formal, Informal, and Social Learning for Sales Mobility Cory Colton, Steven Poyner 1:00 p.m. Session 305 Mobile Sales Training … Google Style Tatiana Chapira 2:30 p.m. Session 703 Utilizing Mobile Touch Devices to Increase Sales-team Performance Ericca Williams, Stephen Haskin 4:00 p.m. Session 805 Using Mobile Performance Support to Improve Sales Rep Performance Phillip Neal 8:30 a.m.
Increasingly experts are noting that mobile learning is hugely useful as a method of performance support rather than as a platform for presenting courses online. If this is your interest, we have identified nine sessions that you can attend. These sessions will focus on performance support as an approach to mobile training. Session 306 Square Peg, Square Hole: Using mLearning for Performance Support Ron Price 2:30 p.m. Session 505 Quickly Build Location-specific Performance Support and Mobile Training Michael Enders 1:00 p.m. Mobile Design Stage The Dirty Secret of Mobile Training Mike Yonker 2:00 p.m. Session 606 Lights, Camera, Action! Scenario-based Learning for Performance Support Ron Price 2:30 p.m.
What if you are an educator in higher education or K-12? Or, a classroom-based trainer? Your interest might be to set up a new mobile learning program that uses off-the-shelf apps in a training curriculum. Session 107 Choosing the Right Apps to Support a Tablet-based Training Curriculum Mike Brock, Paul Kern 10:45 a.m. Session 307 Identifying Mobile Apps for Pre-K to Ph.D. Workforce Development Robbie Melton 2:30 p.m. Session 405 Bonjour, ????? ?, Nín h? o! A Speaking Engagement You Don’t Want to Miss Jennifer Quinlan, Steven Park 10:45 a.m.
mLearning DemoFest A collective showcase of mLearning examples where conference participants show off their latest projects Move from table to table 5:00 p.m.-7:00 p.m. Session 904 You Aren’t in Kansas Anymore: Educating Digital Natives and Immigrants Through mLearning Erika Larson, Ralph Turner 9:45 a.m.
As you can see, no matter what your title consists of, there are tons of things to do at mLearnCon. We look forward to meeting you there.